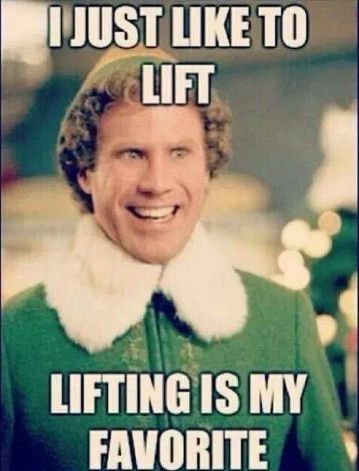 A statement I never thought I would proudly make is “I LOVE lifting weights”. Like, I would lift weights ALL. THE. TIME. if I could. A couple weeks ago Trevor started to add more complexes to the workouts. They are a great way to work on endurance (he has up work through the whole complex without putting the weight down-if the weight hits the floor we have to start all over unless we are just resetting out grip), technique and is just an overall awesome workout. They are quickly becoming my favorite. The complex we worked on last week was Clean Deadlift (the deadlift, in any form is my favorite) -> Clean Pull -> Clean High Pull -> Power Clean -> Clean. For whatever reason, I struggle mightily with the power clean. Hitting the hip power pocket is just something I can’t seem to do. I’m sure it is a lack of coordination on my part, but it is getting better. This workout was more about keeping our form and working on technique rather than worrying about how much weight we were able to lift. It was a great reminder than even though I’m strong in some areas (my pr in the deadlift is 245lbs. ), I need to remember that it’s all about balance when my power clean isn’t so great (my pr in the power clean is 85lbs.). All that work on our technique lead us to working towards a 1 rep max for either a clean and jerk or split jerk later in the week. I haven’t worked much on my split jerk since I ended my time working with Drew, so I opted to go for a 1 rep max in the clean and jerk. This wasn’t my strongest lift since Trevor had us using the power clean to get the bar to our chest rather than working from the rack. We also only had 3 reps to get to where we wanted to go and we couldn’t drop weight. After warming up, I started at 75lbs. I knew I could manage the weight for both the power clean and the jerk but didn’t want to go out too fast too quickly. Thankfully, the weight went up really easily so it was onto my next rep. Because I never know how much to increase my weights by, I tend to stick with 10lbs increases (unless I get the side eye from Trevor and put on more weight) so I went with 85lbs. The weight started to feel heavy, and even though I could feel myself struggle a bit, it was manageable. After getting some tips about keeping my elbows up and working on dropping under the bar more quickly, it was off to 95lbs. I would love to say that I rocked this lift at 95lbs. but I did not. I actually cheated a bit and took 2 reps to try and get this weight up. The first time out, I failed at the power clean. The bar felt really heavy and I just couldn’t get my hands to flip under the bar to get it to my chest. After setting it down and walking away for a bit, I decided to give it another go even if it wasn’t going to count. This time around, the power clean was fantastic. I got the bar to my chest quickly and despite the fact that I HATE having everyone watch me do my lifts, it was nice to have Trevor giving me cues to “get aggressive” when it came time to hoist the bar above my head. Unfortunately, I wasn't nearly aggressive enough and couldn't quite managed the weight above my head and had to bail. But it's nice to know that I'm nearly there. Just need a little extra hard work to get there.